After Yves, after Valérie (Panji) and before Tommi, it's my turn! I leave Paris on the 6th, will spend 2 nights in Oslo and then take the train to Bergen on the 8th. The return journey will also be by train from Trondheim to Oslo. Happy to hear about your voyage. Seems like we have someone travelling with Lofoten every month! So who takes the turn in April? I wish you a bit more snow and some splendid northern lights (February is supposed to be a better month for that: sun activity was quite low in January). I need to hurry up finising my report before you go! Most of us are able to do multi-tasking. So no problem to read more than one report. So take your time and don't even think about to shorten something!! So take your time and don't even think about to shorten something!! Totally agree! And I'll catch up on what I missed when I come back! Tommi, I was thinking the same thing about having one CVF member on board MS Lofoten each month. Fun group challenge for 2013! As says Neil Young I'm sure you're ready for the country. 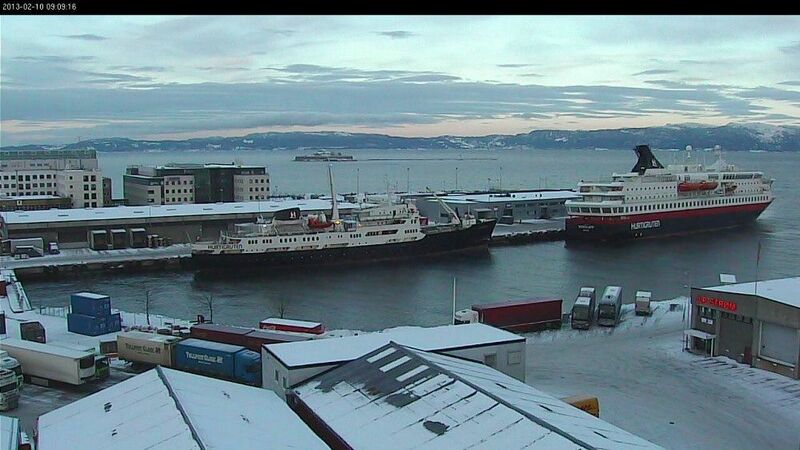 Enjoy Oslo and of course our Lofoten. Have a pint of Mack to my health in the red salon. Last edited by yvneac; February 5th, 2013, 22:19. Have a nice trip Sarnia! I will sit on "the" chair, and drink a beer and think of you all! The suitcase is packed, I leave for Oslo tomorrow. Talk to you soon (or in two weeks!). Well I made it to Oslo where I found a glorious winter weather (cold, snow and sunshine, I'm happy). Tomorrow I take the train to Bergen and from there, you know what happens. Weather forecast still looks good for the next few days, I hope they are right. I haven't sorted out the internet connection issue, so I guess I'll write next when I come back! Thank you Ralf for keeping the Lofoten afficionados happy in the meantime. Stalker pictures from Finse and Bergen this morning: This is terrific weather. You will have fun and plenty to see! We've continued to have stunning weather, both on our train ride and during the first sea day. Today in Trondheim is supposed to be -14°C... I'm overlooking the fjord and Munkholmen and the sea is "smoking". Everything is perfect (except there is a little too many people on board for my liking - around 90 - but everybody ends up finding his/her space. I'm trying to send you some images but uploading is very slow... So maybe next time? I'm probably too late for you to see this Sarnia, but I've just captured the webcam view of LF and NK! Sørlig stiv kuling 15 utsatte steder, periodevis sterk kuling 20 ved Porsangerfjorden. Torsdag ettermiddag minking til sørvestlig liten kuling 12 utsatte steder, om kvelden frisk bris 10. Oppholdsvær. Sørvestlig stiv kuling 15 utsatte steder, i nord sterk kuling 20 og i kveld periodevis liten storm 22. Fra torsdag ettermiddag sørvestlig liten kuling 12 utsatte steder, men fortsatt periodevis stiv kuling 15 ved Varangerfjorden. Oppholdsvær. Southern gale 15(F7) exposed, periodically stiff breeze 20(F8) by Porsangerfjord. Thursday afternoon abatement to southwesterly gale 12(F6) exposed, in the evening fresh air 10(F5) Sunny weather. Southwesterly gale 15(F7) exposed in northern gale 20(F8) and in the evening intermittently stormy weather 22(F9) From Thursday afternoon southwesterly gale 12(F6) exposed but still periodically stiff breeze 15(F7) at the Varanger Fjord. Sunny weather. Hello all! I left the ship this morning in Trondheim and I'm on the train to Oslo. This trip turned out to be the perfect winter trip, complete with sun, snow (both on the ground and mountains and also falling), wind, all shades of blues and pinks and yellows and greys and whites, wind, a bit of fear and excitment (in relation to the cancellations in the north), and the most amazing Northern Lights. It was all I hoped for and more. Now I have over 3000 pictures to sort through... I'll show you when I get home (I fly back to France tomorrow).